Faraj Suleiman, Palestinian composer, and pianist who was born in AlRamah in the Palestinian Galilee in 1984, and currently lives in Haifa. Suleiman composes instrumental and vocal music for theater and cinema. He strives to produce a diverse work in a variety of disciplines, juggling different experiences. He has composed solo pieces on Piano and is keen to move between Piano and Oud, integrating oriental sound, the orchestra, and musical theater. He also has worked on several musical productions that incorporate modern Arabic poetry, such as the poetic concert «love in the cloud,» and the poetic music album «AlBashiq» from the poems of Taha Muhammad Ali. 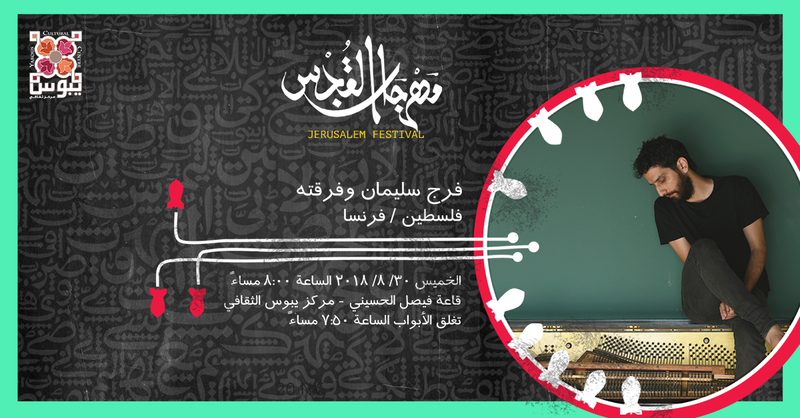 Some of his work includes: «login» (2013) «Three Steps» (2013) «Love in the cloud» (2014), «AlBashiq» (2014), «Mid spring Holiday» (2015), «Mud» (2015), «Opening of the Palestinian Museum» (2016), « Condolences» (2016), « Aekara» (2017), « Once upon a city.» (2017), «Love without a Story» (2017). And his latest production “Toy Box“ which was released in 2018. Shehadeh Hanna (Oud) and Maen Ghoul (Percussion).